Travelling north-east on the 4WD road after the Kenyan border crossing, we passed through the highly populated country side with many small towns. 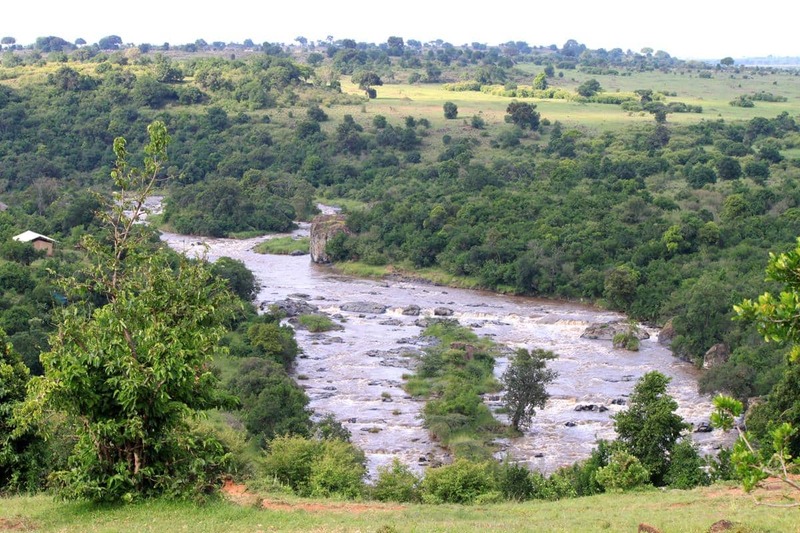 Our route took us down the escarpment to the northern edge of the Masai Mara National Park which abuts the Serengeti to the south. The view into the Park was spectacular: green grassy plains dotted with iconic Acacia trees as far as the eye could see! 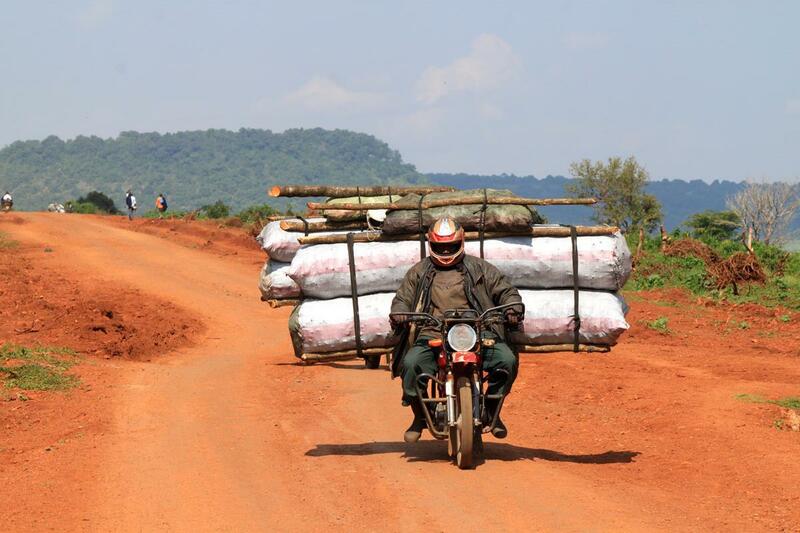 Transporting heavy loads like bags of charcoal by motorbike is a familiar sight in Kenya. We had several camping options lined up, the first being quickly eliminated after the gate guard, leaving the gate firmly shut, informed us that they didn’t cater for our rooftop tent but could offer accommodation in their tented camp at US$ 450pp per night. We still had time to investigate other options and in response to a brightly painted sign, took a rutted track along the Mara River towards Tembile Camp. The presence of one faint set of vehicle tracks along this atrocious road encouraged us to persevere at a crawl, often in low range 4WD, towards what we hoped would be an idyllic night stop. Finally the indistinct track disappeared altogether and we turned back; the 13km round trip had taken almost an hour and sunset now approached. 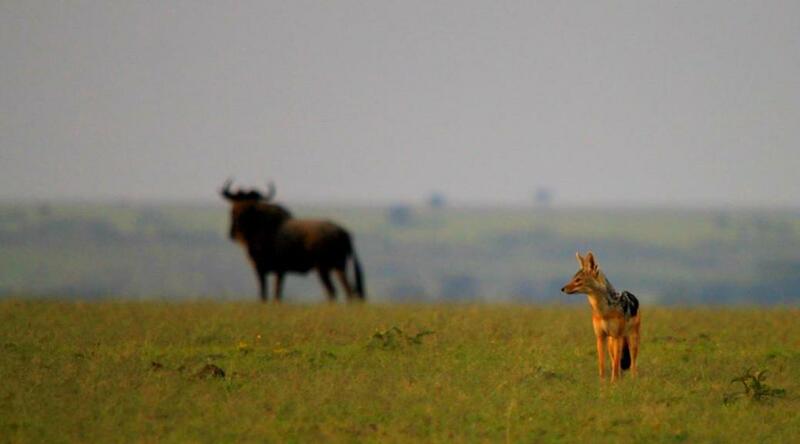 We passed through flat, green grassy plains with few villages where surprisingly, domestic animals mingled with large numbers of game overflowing from the Masai Mara Park. We didn’t expect to bush camp on our first night in Kenya, but after several more fruitless quests we followed a faint track towards a copse of trees and bushes about 400m off the road. Around the rear of these we made our way into a clear, low area and set up camp quickly before dark, enjoying the peace of the unique surroundings. That night we were treated to the usual sounds of Africa by night and in the early morning after being surprised to hear a pride of lions very nearby, we had a good look around before we got out of the roof top tent once the shower of rain had stopped and dawn broke. Being parked on notorious black cotton soil and in a depression, we were relieved not to bog down on the way out, but the road was as slippery as an ice rink after even this light shower. 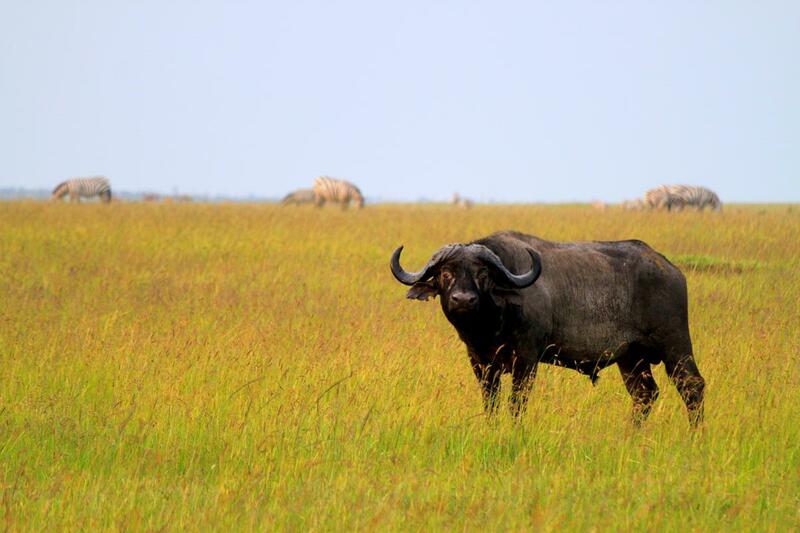 We were once again astounded by the number of wildlife that we saw outside of the park. 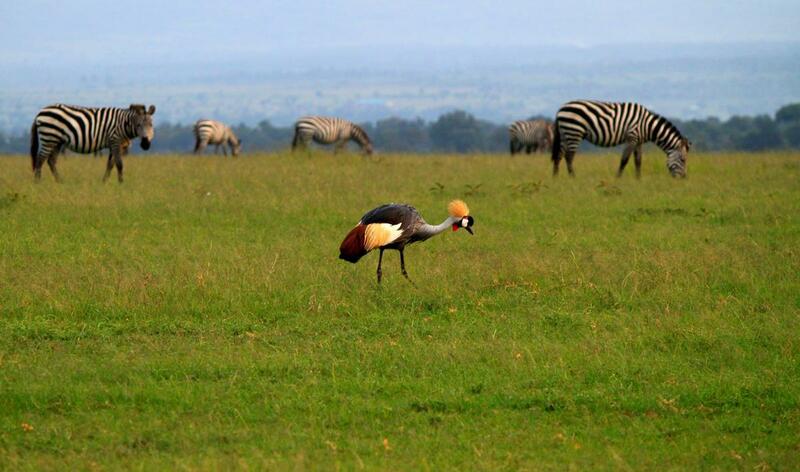 A Grey crowned crane with zebra grazing in the background. Thirsting for our mid morning coffee stop and a bite to eat, we pulled off the road and drove up a grassy verge, stopping under the shade of an Acacia tree. 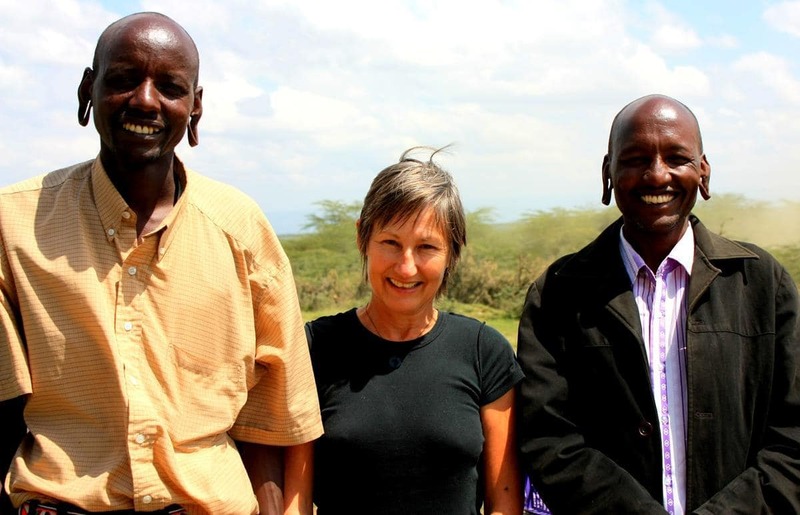 We hadn’t been there long when two Masai men arrived on a motorcycle and, full of smiles, offered us a friendly greeting. Communication outside of the pleasantries was impossible but sign language enabled a very pleasant interaction. We admired their ear lobes which had been pierced and stretched into big loops which they proudly pulled over the top of their ears. As we were having Provita, peanut butter and jam we offered them some. The one man took a morsel, inspected it rather critically and then hesitatingly put it into his mouth and chewed thoughtfully. His expression, strictly neutral throughout, gave nothing away, but his refusal of more told the story. The other guy inspected the jars, firmly declined the peanut butter and opted only for jam, pointing to the black cat on the Black Cat Peanut Butter jar. Our attempts at explanation were useless and we broke into gales of laughter as we drove off, realising that they thought we were eating bottled cat meat! Jungle Junction on the western outskirts of Nairobi was our destination for the next few days to give our limited and grubby wardrobe its first machine wash in three months, get the vehicle serviced, shop, catch up on jobs and decide what we want to do with our time in Kenya. We had learnt that Burundi is off limits to travellers right now, with refugees streaming into Tanzania, and we had heard that we may not be able to enter Eritrea as we have Ethiopian visas in our passports. This could rule out these two countries, as well as Sudan, where temperatures are very high now and through which we would have to transit to Eritrea. So we have more time than anticipated and networked with fellow travellers and Chris, the owner of Jungle Junction, over our itinerary. Jungle Junction was our most ‘sticky’ camp thus far, being a hub for like-minded travellers and with its many convenient amenities like mechanical servicing and repairs. 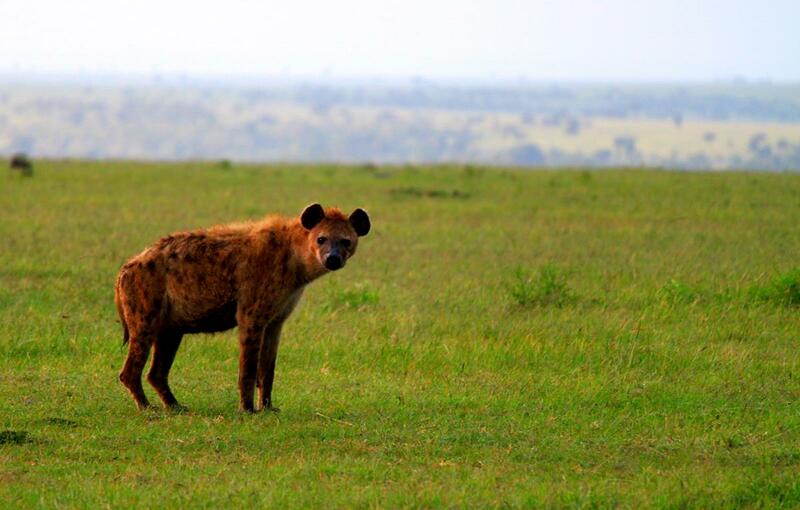 We ended up spending more than a week there before heading north-west to Lake Naivasha. Just north of Nairobi there is an awesome viewpoint over the Great Rift Valley and further on we passed cattle grazing in unfenced lush green pastures among pine forest, despite many vehicles speeding past nearby on the highway. We were surprised to see zebra and a variety of antelope grazing next to this road and also unfortunately, a dead hyena. Overlooking the Great Rift Valley. 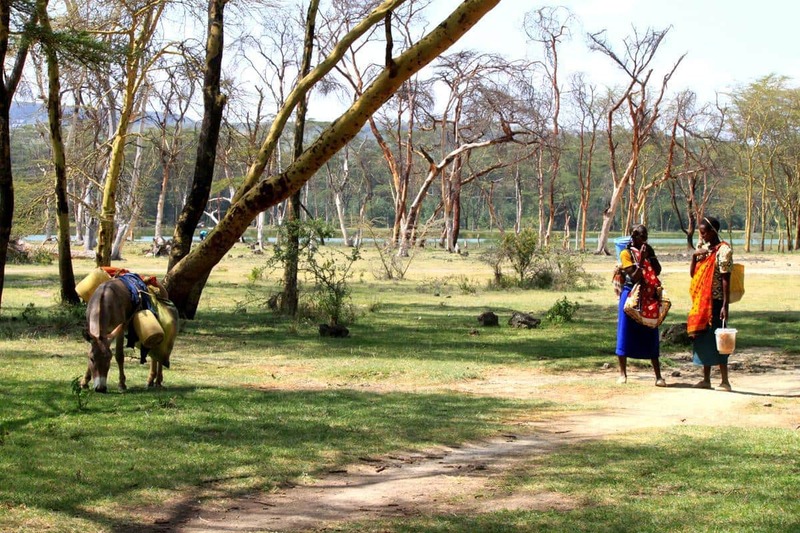 Taking a back road to Lake Naivasha afforded us beautiful views of the volcanic lip of Mount Longonot but unluckily this very rough track dead ended in what looked like a newly constructed fence, so we had to re-route, arriving at Lake Naivasha Resort shortly before dark. There we were greeted by crisp green grass under tall yellow fever trees, just a few metres from the shore. Despite being near the equator, the evening was cold with a chilly breeze and we drifted off to sleep to the snorting of hippos and were awakened to the trill of birdsong and the cries of fish eagles. 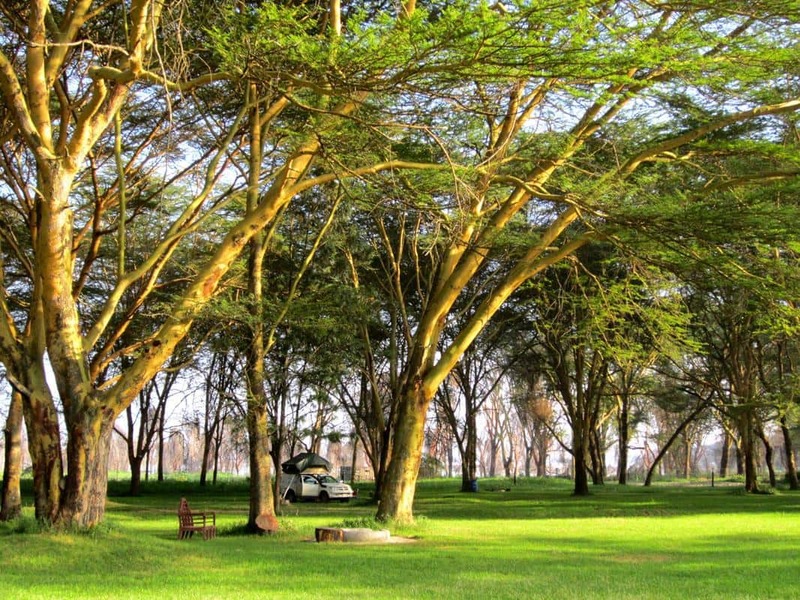 Camping under magnificent yellow fever trees at Lake Naivasha. It took little encouragement to spend another day at this awesome spot, where a short walk to the water’s edge took us within a few metres of yellow billed storks, pelicans, marabou storks and smaller water birds. 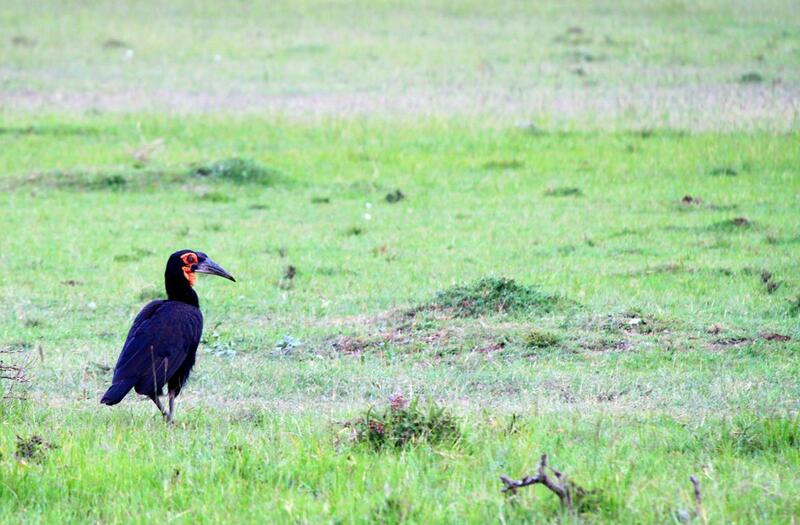 There is a prolific bird life at Lake Naivasha. A young pelican floating past. 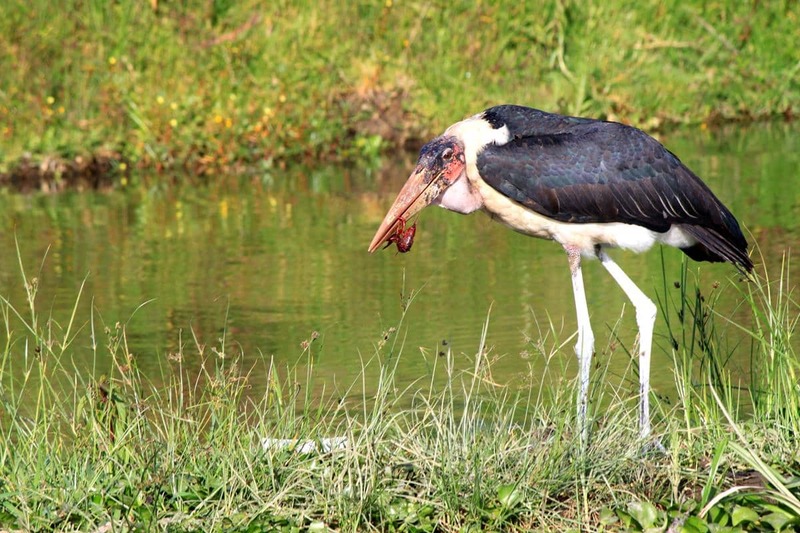 Marabou stork enjoying a meal. 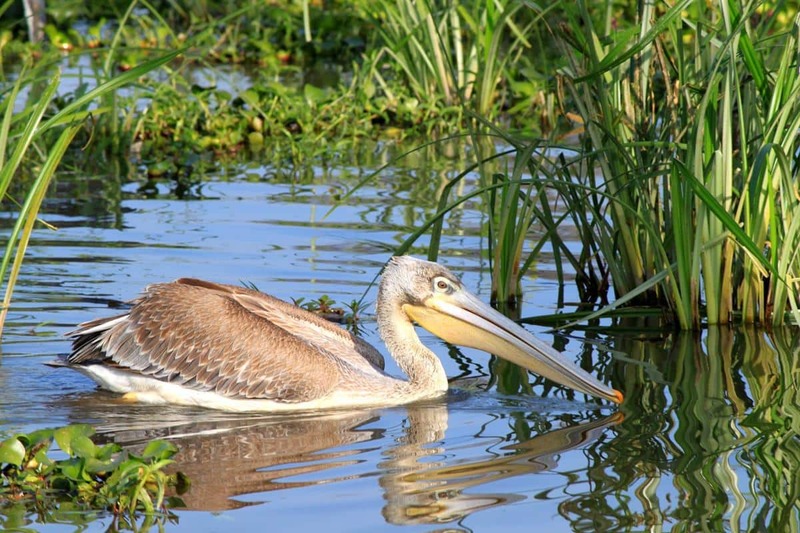 Noticing that there are several more lakes to the north, we decided to next head for Lake Nakuru National Park. We once again took an interesting minor back road, hugging the southern shore of Lake Elmenteita, where we enjoyed a coffee stop under shady yellow fever trees close to the lake. Women walking past while we were having coffee at Lake Elmenteita. A while later we passed through grassy plains where we saw buffalo, giraffe, springbok, impala, warthog, baboon and zebra, all intermingled with livestock. This was a conservancy area but the gates indicated on the GPS did not exist any more. Luckily we only had to divert 2km from our route to discover that Lake Nakuru is a premium park (like Amboseli which affords beautiful views of Mount Kilimanjaro) which meant that it was way out of our budget and even more expensive than Serengeti. Heading further north to Lake Bagoria we crossed the Equator in low-key fashion, with no signposts alerting us. Lake Bagoria is renowned for its hot springs which attract huge flocks of flamingos at certain times of the year. Again, it wasn’t possible to get close to the lake without paying national park entrance, vehicle and camping fees, so, being late in the day, we pressed on for Lake Baringo where we set up at Roberts Camp, a few metres from the water. 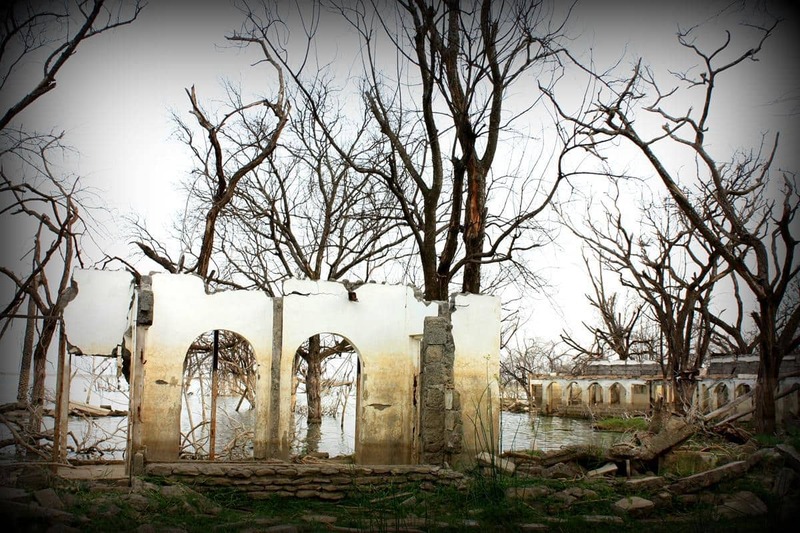 The country hotel next to Roberts Camp was flooded a few years ago. Smoke from fires lit at intervals along the shoreline to keep the resident hippos away, warmed the already hot air and once it got dark, these animals ventured even closer as we ate our evening meal. The bird life here is plentiful. A pair of nesting fish eagles was perched nearby, high up on a dead tree over the lake. We imagined that there were chicks in the nest, as at one point, both parents swooped down in attack, one of them clasping another predatory bird with its talons before letting go. This foray launched the large resident Verreaux’s Eagle Owl to join the fray, chasing the eagles back to their nest. 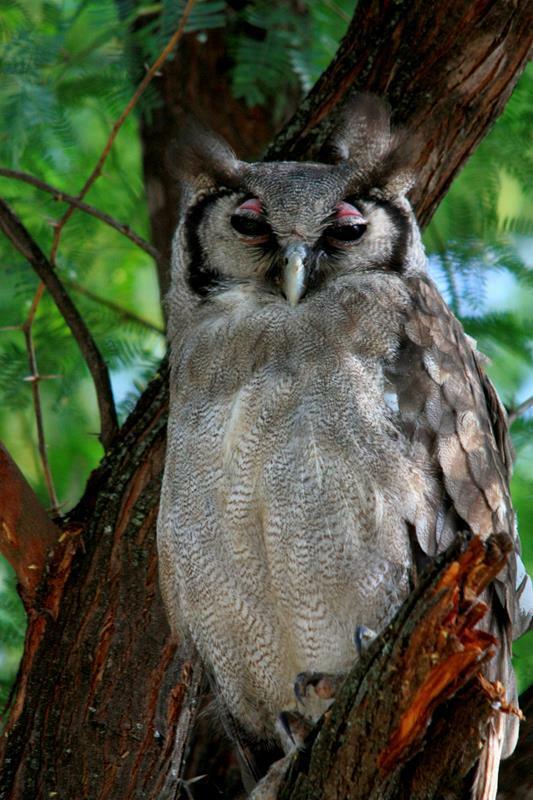 The Verreaux’s Eagle Owl having has midday nap. 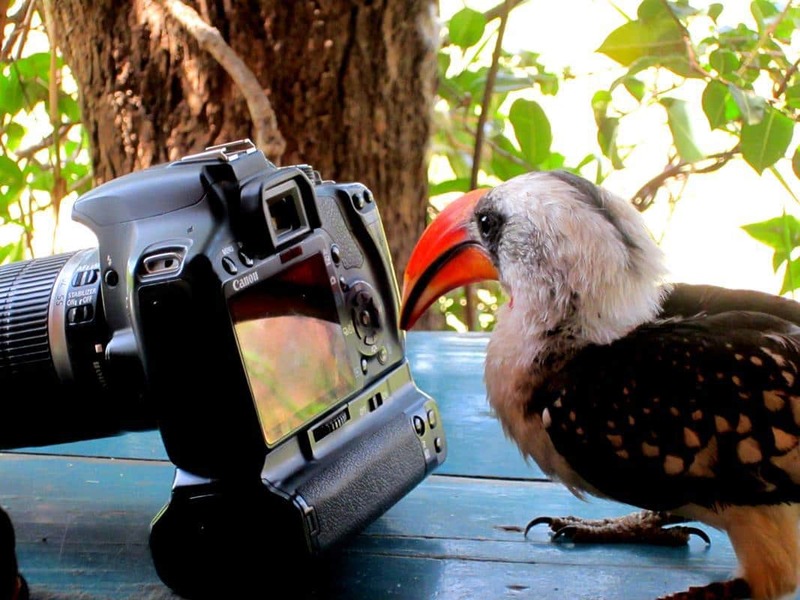 One of the domesticated hornbills at Roberts Camp, admiring himself in my camera screen. Our exercise routine has taken a bit of a beating, coming second to all the trip activities, and we vowed to correct this. We got up at sunrise and after coffee and breakfast we hit the road. Passing through Baringo village we soon had a trio of young boys joining us on our run. The boys were very grateful for the cold drinks and chips after the run. Our overall impressions of Kenya so far are that the people are warm and friendly, game abounds even outside conserved areas and it is beautiful, green and fruitful. We are looking forward to exploring more before we head up along the eastern side of Lake Turkana to Ethiopia. Excellent photos, Karin! And your descriptions really brings the trip to life! Stunning photo of that birdlife. So Lake Nakuru is ‘upgraded’ to premium. It was decently priced a few years ago. To bad. But if nature doesn’t generate money it’s end is in sight unfortunately. 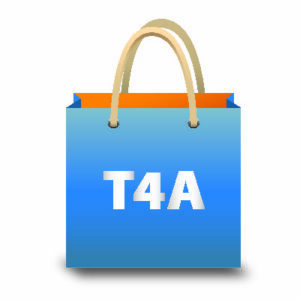 Great blog and pictures , Country ,game and people look awesome. Look forward to every update . Travel safely . LOL Roger and Lorraine . 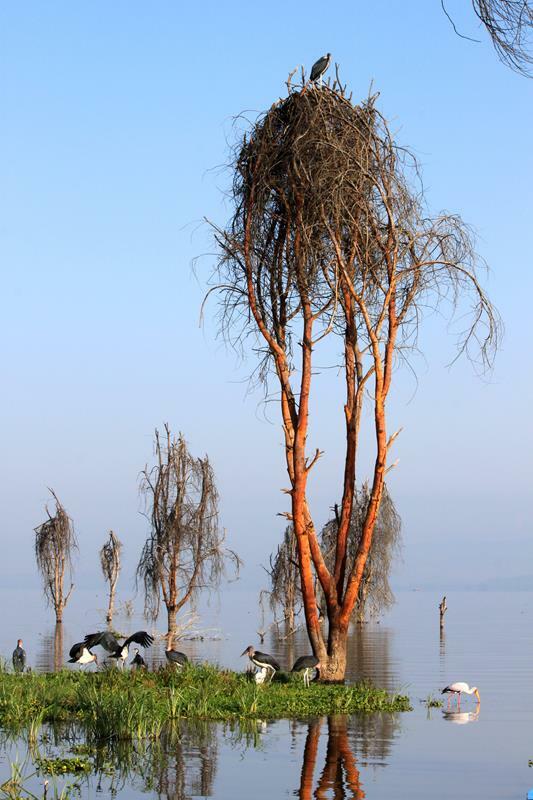 Lake Naivasha looks absolutely amazing – jealous!